Swedetown Super Blue Moon Night Ski. When: Monday, January 29, 2018 at 7 p.m.
Meet up at 7 p.m. and plan to ski at 7:15 p.m. for about an hour (depending upon the weather). Groups will be led by skiers familiar with the trails. We will divide groups by ski ability, so everyone feels comfortable with the time/distance to ski. Please bring a headlamp if you have one. Children are welcome with an accompanying adult. Free hot chocolate for all in the Chalet after skiing. Bring your skis and let’s hope for clear skies to see the moon and ski in some awesome moonlight! Introducing: “The Maasto Churning Grand Traverse”. Skiers will meet at the Tomasi trailhead at 12:30 and head out for some fun backcountry skiing. The route: We’ll start blazing trail almost right away, heading through the woods down to our Swedetown Creek fording spot. Next we’ll make our way to and over Ruby Marsh in Churning Rapids, then past the tower. We’ll glide on down Pow Pow and Finney Creek trail, then hit the groomed track to the Christensen Rd trail head. New this year – kids will participate for free, thanks to sponsorship from the Portage Health Foundation. 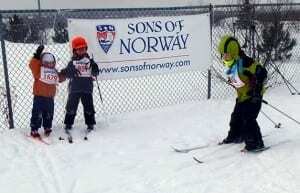 As always, the Barnelopet is organized jointly by KNSC and the Sons of Norway’s Ulseth Lodge, and is made possible by the City of Hancock. Kids! Join us for a fun day of skiing at Hancock’s Maasto Hiihto trails. When you complete the course, you’ll be awarded a medallion and be served hot chocolate and cookies plus healthy snacks to celebrate.